Jimmy Butler celebrates after hitting his big shot that sealed the Philadelphia 76ers' 118-115 win over the Boston Celtics at the Wells Fargo Center on Wednesday night. Let this sentence sink in for a moment: On Wednesday, the 76ers defeated the Boston Celtics, 118-115, at the Wells Fargo Center, for just their fourth victory in the rivals’ last 25 meetings. Since last month’s trade deadline, the Sixers (47-25) have been regarded as an Eastern Conference title contender. And they played that way for the most part in their eight games with Jimmy Butler, Tobias Harris, Joel Embiid, JJ Redick, and Ben Simmons in the starting lineup. They were 6-1 in their first seven games. But, days after the trade deadline, the Celtics (43-29) handed the Sixers a 112-109 home loss. At the time, the thought was that the Sixers were just inferior to their Atlantic Division rival. Harris added 21 points. Redick added 17, while Simmons finished with 13 points, eight rebounds, and seven assists. The starters’ dominant play enabled the Sixers to overcome their bench, which scored a paltry 8 points. Kyrie Irving paced the Celtics with 36 points. 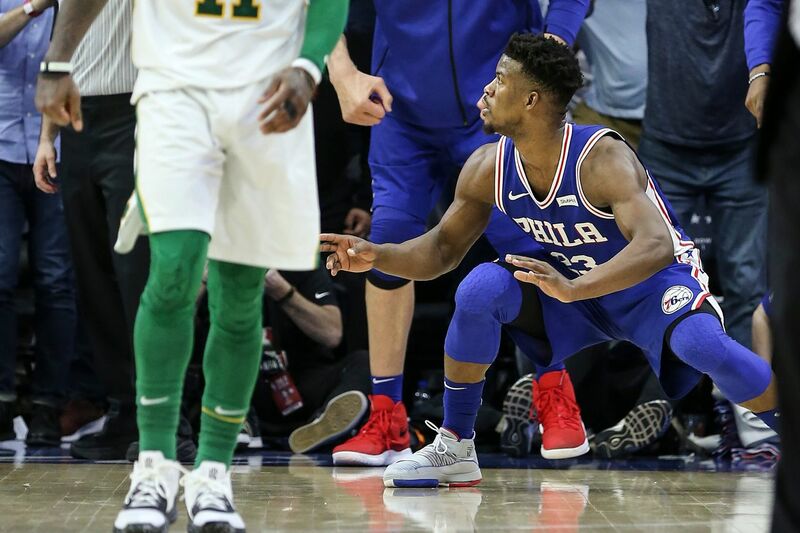 The win extended the third-place Sixers’ winning streak to six games and kept them from being swept in the four-game series season with the fifth-place Celtics. From the start, this one had a different vibe. This game was a confidence boost for a squad looking to reach the NBA Finals. From a psychological standpoint, the Sixers needed to learn how to beat Boston. “To overdramatize it doesn’t interest me, but I think there’s a little bit of it,” coach Brett Brown said before the game. Emotions were on overload, as the Sixers treated this contest like it was postseason tilt. There was a pregame video showing favorable Philly highlights from Celtics games. The video concluded with a clip of Embiid dunking on Celtics center Aron Baynes. Former Sixers Eric Snow and Larry Hughes were introduced to the sellout crowd of 20,606. Joel Embiid had a game-high 37 points to go with a career-high 22 rebounds to help lead the Sixers to victory. But the Sixers were more fired up than their fans. Brown received a technical foul for protesting an Embiid foul with 4 minutes, 33 seconds left in the second quarter. Things got more heated 54 seconds into the second half. Marcus Smart took exception to Embiid’s hard pick that knocked him to the court. Smart got up and shoved the center in the back, knocking him to the floor. Embiid got up and had to be separated from Smart. After reviewing the play, the referees gave Smart a flagrant type-2 foul, which comes with an automatic ejection. Embiid received a technical foul. That seemed to motivate Embiid, who went on to score 15 of his points in the third quarter. After one play, he bent down and talked trash to North Philly native Marcus Morris, who was flat on his back. Thanks to Embiid’s effort, the Sixers were able to battle back from their double-double deficit. Mike Scott’s foul shot with 3:48 in the third quarter gave them their first lead of the game, 83-82. The lead seesawed before the Celtics built a 9-point lead (99-90) with 8:58 remaining. But, Butler made back-to-back three-pointers to knot the score at 105 with 5:05 left. After a couple of lead changes, Simmons’s three-point play gave the Sixers a 116-113 lead with 40.8 seconds left. Then Butler hit jumper with 5.5 seconds left to put Philly up five. Meanwhile, Morris pointed out that the Celtics still won the season series when asked about the number of foul shot Embiid took. “What’s the season series?" he asked before being informed 3-1. About time that Embiid had a big game against the Celtics? The Celtics were without Gordon Hayward, who is in the NBA concussion protocol. Baynes suffered a game-ending left-ankle sprain with 5:07 in the second quarter. Boston’s being undermanned didn’t go unnoticed by T.J. McConnell, who pointed out that his team also won its final regular-season series game against the Celtics last season. “I’m not try to be a Debbie Downer,” he said. "But they still beat us three times. I’m not a fan of moral victories. They rested Gordon Hayward. Was Al Horford on a minute restriction? I don’t know. So, it will be a different team in the playoffs. That’s when it matters.